A group of prominent former European officials have called on the EU foreign chief to review the bloc’s policy towards the Palestinian issue and find an effective way to hold Israel accountable for its actions in the occupied territories. “We maintain our view that the current financial and political assistance given by Europe and America to the Palestinian Authority achieves little more than the preservation of the Israeli occupation of the West Bank and imprisonment of Gaza. The Palestinian Authority's tenuous grip on the West Bank population's allegiance has required strong security and other dependence on Israel, funded primarily by Europe and the US. 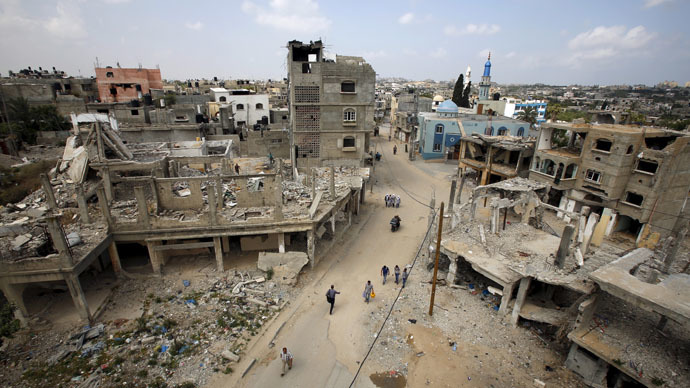 Gaza has shamefully been left to one side,” the group has stated, adding that the re-election of the Israeli PM Benjamin Netanyahu has only made things worse. Netanyahu has pledged that a Palestinian state would not be established on his watch. “I think that whoever today moves to establish a Palestinian state and withdraw from territory is giving attack territory for Islamic extremists against the state of Israel,” the Israeli PM told NRG in March. “Mr. Netanyahu expressed various views on Palestine in and around the recent election campaign, most of them cold to the concept of an independent Palestinian state. We are convinced in our own minds that he has little intention of negotiating seriously for a two-state solution within the term of this incoming Israeli government,” the letter stated. Meanwhile over 500,000 Israelis currently live in settlements in the West Bank and around East Jerusalem which were built after the 1967 Israeli occupation of the Palestinian territories. The occupied territories of the Palestinian West Bank and Gaza Strip have been seeking full statehood and independence from Israel for five decades. In 2012, Palestine were granted non-member, observer-state status in the UN. Its April 1 accession to the International Criminal Court (ICC) became a red letter day for the nation, marking a landmark step in Palestinians' legal campaign. It's hoped that the move will help seek justice for Israel’s operation ‘Protective Edge’ last summer, in which thousands of civilians were killed in Gaza. “Europe should engage with the Palestinians on responsible use of the ICC, recognizing that its powers will be applicable to Palestinian just as much as to Israeli actions,” the former officials stated in their letter. The group says it's likely that the status of Palestine will come before the UN Security Council later this year. US President Barack Obama has meanwhile told a London-based Arabic newspaper Asharq al-Awsat earlier this week that he is still cherishing hope for a two-state solution to the Israel-Palestinian conflict. He said tensions in the Middle East and "serious questions about overall commitment" have made progress challenging, however. "It's no secret that we now have a very difficult path forward. As a result, the United States is taking a hard look at our approach to the conflict," Obama said, adding that Washington is now looking to the "new Israeli government and the Palestinians to demonstrate - through policies and actions - a genuine commitment to a two-state solution."